There has been no shortage of controversy in both the mainstream and social media networks lately over Syrian refugees. Canada has committed to accepting 25,000 of them over the next few months. This has prompted criticism – and worse – from every kind of fear-mongerer, racist, and xenophobe. Meanwhile, desperate people are trying to escape terrorism and get to safety. Look at this heartbreaking image from a news article about where refugee children sleep. I see the posts against allowing the refugees and I see the posts condemning those people who don’t want the refugees. Here’s the problem with the refugee’s – it only takes 1 member of ISIS to hide among them and be allowed in. Only 1. To live in a free country means to preserve that freedom, at all costs. To some I know that sounds so savage and uncaring, but it’s my country too. My free & safe country and I believe that it should be protected at all costs. I think I come at it from a different, more – for lack of a better word, selfish – angle, and I hate that it makes me look selfish, that it makes me look uncaring and unyielding because I am not. The freedom of Canada is becoming more and more diluted the more we accept others’ values, beliefs and mores over the ones that created the country. While I agree that evolution is evolution – change has to occur in order to have progress; truth be told, many of the beliefs and values of those entering Canada are not in tune with that freedom, and more and more those holding those beliefs are asking to be more and more recognized. Sharia law for instance – it’s practiced here on our free land and my fear is that one day it will actually be recognized. To accept more and more beliefs that are completely anti-freedom (those beliefs and values that fly in the face of freedom like women’s rights, gay rights, and humanitarian rights) well, that is a slippery slope. Freedom comes with the responsibility of preserving it. How do we preserve it? Right now in Canada we have some of the highest child poverty rates among 1st world nations, cities with no family physicians available so thousands of people have to rely on a ‘walk in’ system, wait lists for surgeries that extend into months, sub-par education and education facilities, failing infrastructure in most major urban centers, a CPP that arguably won’t exist in 20-30 years, an aging population that health care will not keep up with, unaffordable housing in most major urban centers – how do we cope with that while allowing thousands upon thousands of refugees in? I know it’s selfish of me, I hate that it is… but I don’t know how to blend these issues so that they make sense. Ah, so people in Canada have the “freedom” to be exactly like you are. And it’s OK to let innocent bystanders from a war zone suffer and die by the thousands because they might want to come here and cause you inconvenience with their differences. Don’t get me wrong, I’m not OK with allowing what I consider to be backward and horrid practices here, like ‘honour’ killings or gender segregation, but I certainly am not harmed by having the necessary conversations about them. And that’s a different topic from giving necessary aid to humans in desperate need. We already have hundreds of thousands of Muslims in Canada (among many other groups) and we’re OK. Having challenging conversations about how we build our society together doesn’t deserve to be in the same sphere of conversation as whether we should save people from genocide. We can afford to be inconvenienced by crumbling roads and dwindling CPP as the worst problems of our mismanaged wealth; people can’t survive *at all* in a genocide. It’s a no-brainer. Sad to say that historically, fear and rejection of newcomers is nothing new. Anne Frank might be a 75 year old woman living in the US today if her family had been able to get out of Germany in the 1930’s. 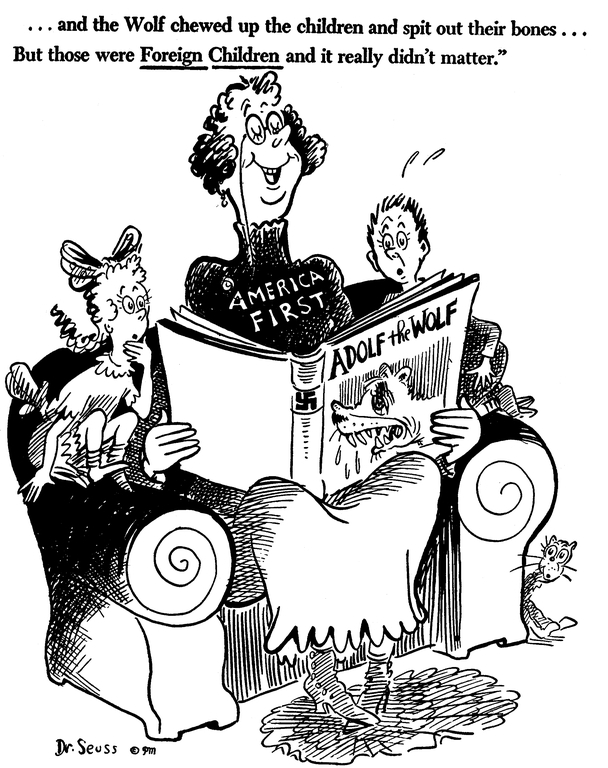 Dr Seuss, who later wrote children’s books, drew this political cartoon in 1938, and it still rings true today. 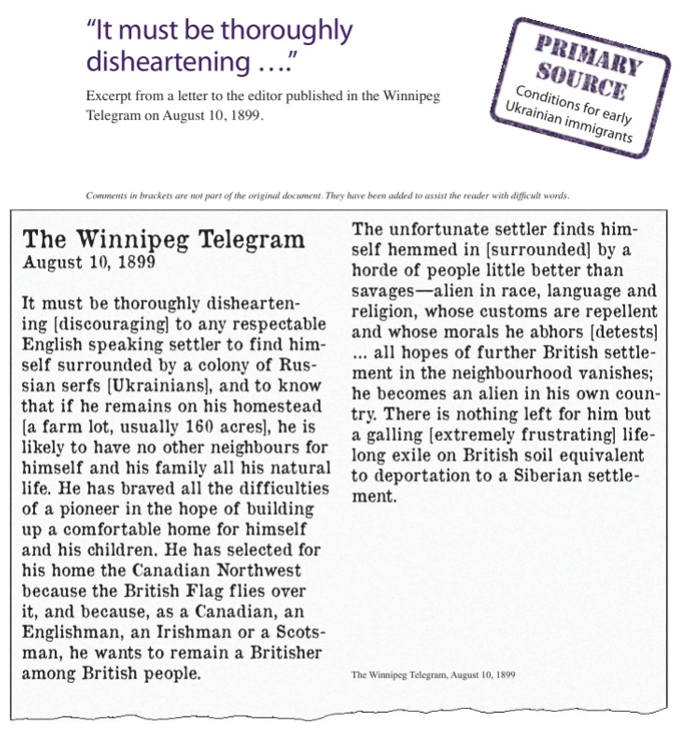 “Foreigners’ weren’t always so welcome here in Manitoba, either, decades ago, as history shows. It can sometimes be difficult to separate out criticism of ideologies from bigotry against entire groups of people. But separate them we must, because the lives of innocent victims are at stake. Here is an example of a meme that’s been circulated lately on social media. 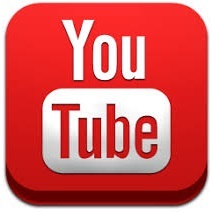 It illustrates the kind of conflict that develops when people confuse the two. 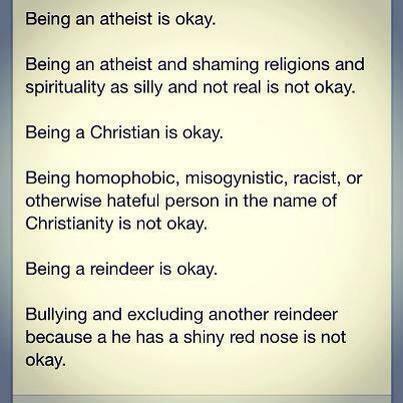 I’ve seen this in my newsfeed a few times lately and I feel the need to address point #2. Promotion and acceptance of irrational and superstitious beliefs is NOT okay. People deserve respect. Ideas and ideologies do NOT automatically deserve respect. Ideas should be open to debate in the public sphere, where they must earn respect based on their own merits. Religious ideologies – ALL of them – fail in this regard, because religion itself is not based on evidence or rational thinking. Perhaps many Christians have forgotten that it wasn’t so long ago their own religion was burning witches at the stake. There are plenty of evangelical leaders today who are just as fervent about their own brand of theocracy as Muslim leaders are about theirs. The level of violence hasn’t been equaled – yet – but the potential is there (for an example, look up Uganda’s “Kill the Gays” bill). At best, religious thinking leads people to make decisions without sufficient evidence, and which are therefore often not in their own, or society’s, best interests. On a personal or local level, such bad decision making leads to individuals taking comfort in the supernatural rather than seeking legitimate treatment for ailments like mental illness, PTSD, or addictions; and children being denied proper health care and education. On a societal level, it leads to poor policy decisions on issues like global warming, denial of basic human rights to minority groups like the LGBT community, and, at the extreme end, terrorist attacks. I will continue to call out nonsense and irrational thinking when I see it, and I’m not apologizing for that. Speaking out against irrational ideas, however, is NOT the same thing as attacking individual people. Unfortunately, every new terrorist attack brings out the xenophobes – the anti-immigration rants, the racists, the gun-toting right-wing nut-jobs. Adding this kind of hatred and intolerance to an already violent situation only makes the atmosphere more toxic and the situation more desperate for the victims. Refugees are fleeing the same terrorists that the rest of the world is fighting, and most have no place to return to. As fellow human beings we need to offer assistance and place to stay. Have we already forgotten the lessons of WWII? If you are still concerned about accepting Syrian refugees, read this.